With the protest by Jat agitators affecting life in Haryana and Uttar Pradesh, the Centre will on Wednesday hold talks with representatives to find a solution to the vexed issue. Home minister P Chidambaram and social justice minister Mukul Wasnik will hold talks with an 11-member delegation of Jats led by Yashpal Malik, who is learnt to have been getting tactical support from Uttar Pradesh chief minister Mayawati. Malik will represent the Akhil Bhartiya Jat Arakshan Sangarsh Samiti (ABJASS), which has been in the forefront of the agitation by disrupting movements of trains in many areas. Representatives of other factions will also meet both the ministers. In a bid to find an amicable solution to Jats' demand for reservation in Central government jobs under the Other Backward Classes (OBC) category, the United Progressive Alliance government has invited their leaders from Uttar Pradesh and Haryana for talks. The decision to hold talks with the Jats, whose week-long agitation has disrupted rail traffic, with protesters squatting on the track in various parts of north India, was taken on Tuesday at a meeting of the Cabinet Committee on Political Affairs, chaired by Prime Minister Manmohan Singh. Attorney-General G.E. Vahanvati was present. Home Minister P. Chidambaram and Social Justice and Empowerment Minister Mukul Wasnik will be the government's representatives at the negotiations, likely to be convened on Wednesday, official sources said. The agitation also figured in the Rajya Sabha, with the government assuring MPs that it would make a statement on Wednesday. 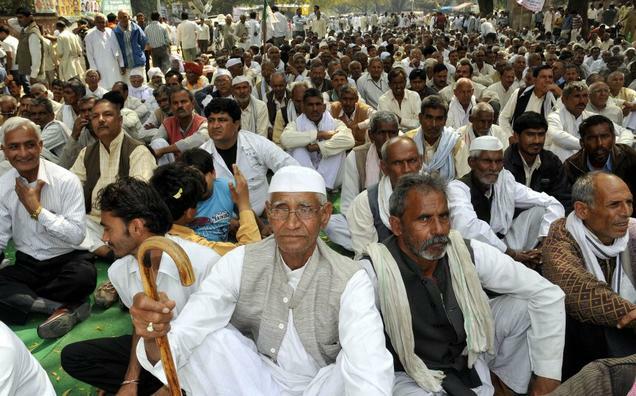 The decision to call the agitators for talks was taken after the Jats threatened to cut all essential supplies to Delhi if their demands were not met by Thursday. The agitators have also threatened to block oil supply from the Mathura Refinery to Delhi. Meanwhile, at a Congress briefing, party spokesman Abhishek Singhvi parried questions on the party's stand on the Jats issue, saying it was “delicate and sensitive” and could be resolved only through dialogue. Stressing that his party was opposed to violence, he said all stakeholders, including the Haryana and Uttar Pradesh governments, should resolve it through discussions. In Haryana, the Assembly witnessed uproarious scenes for over 80 minutes over the Jat stir.